434 Marlborough is located on the south side of Marlborough, between Massachusetts Avenue and Charlesgate East, with 432 Marlborough to the east, and 436 Marlborough to the west. 434 Marlborough was designed by architect Obed F. Smith and built in 1885-1886 by Charles H. Dodge, mason, for building contractor George Wheatland, Jr., for speculative sale, one of six contiguous houses (430-432-434-436-438-440 Marlborough), arranged in a symmetrical group, the three to the east (430-434 Marlborough) with bays on the eastern side, and the three to the west (436-440 Marlborough) with bays on the western side. The peaks of the bays have varied designs. George Wheatland, Jr., is shown as the owner on the original building permit for 434 Marlborough, dated October 16, 1885. At the same time, George Wheatland, Jr., was having six more houses built at 381-391 Commonwealth on the lots to the south, behind 430-440 Marlborough, also designed by Obed Smith and built by Charles Dodge. 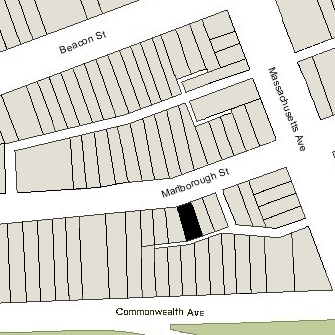 Click here for an index to the deeds for 434 Marlborough, and click here for further information on the land west of Massachusetts Avenue between the south side of Beacon and the north side of Commonwealth. On October 1, 1886, 434 Marlborough was purchased from George Wheatland, Jr., by Warren Bailey Potter Weeks, an insurance and real estate broker. He and his wife, Gertrude Carruth (Washburn) Weeks, made it their home. They had married in December of 1885 and had lived briefly at the Hotel Huntington (af the intersection of Huntington and Blagden, near Dartmouth). Prior to their marriage, he had lived at 14 Newbury with his parents, Andrew Gray Weeks and Harriet Pitts (Pierce) Weeks. On May 2, 1889, Warren Weeks transferred 434 Marlborough into his wife’s name. Warren and Gertrude Weeks continued to live at 434 Marlborough during the 1892-1893 winter season, but moved thereafter to 467 Commonwealth. 434 Marlborough was not listed in the 1894 and 1895 Blue Books. On April 11, 1895, 434 Marlborough was purchased from Gertrude Weeks by Gertrude (Pound) Clement, the wife of Edward Henry Clement. They previously had lived in Brookline. Edward Clement was editor-in-chief of the Boston Transcript. Gertrude Clement died in December of 1896. In her will, she left 434 Marlborough to her husband. Charles Clement continued to live at 434 Marlborough and in March of 1898 married again, to Josephine (Hill) Russell, the widow of Charles G. Russell. After their marriage, they lived at 434 Marlborough until 1900, when they moved to Brookline. 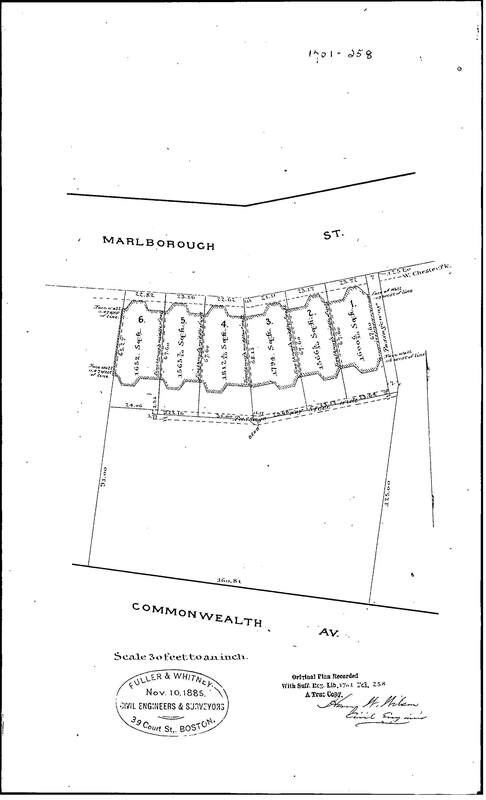 On September 5, 1900, 434 Marlborough was acquired from Edward Clement by Alexander Porter Browne, a lawyer. By the 1900-1901 winter season, 434 Marlborough was the home of Alexander Browne’s brother and law partner, Causten Browne, and his wife, Katharine Eveleth (Maynadier) Browne. They had lived at The Kensington at 687 Boylston in 1900. Katharine Browne’s brother and sister-in-law, James Eveleth Maynadier and Mary West (Wright) Maynadier, lived at 432 Marlborough. 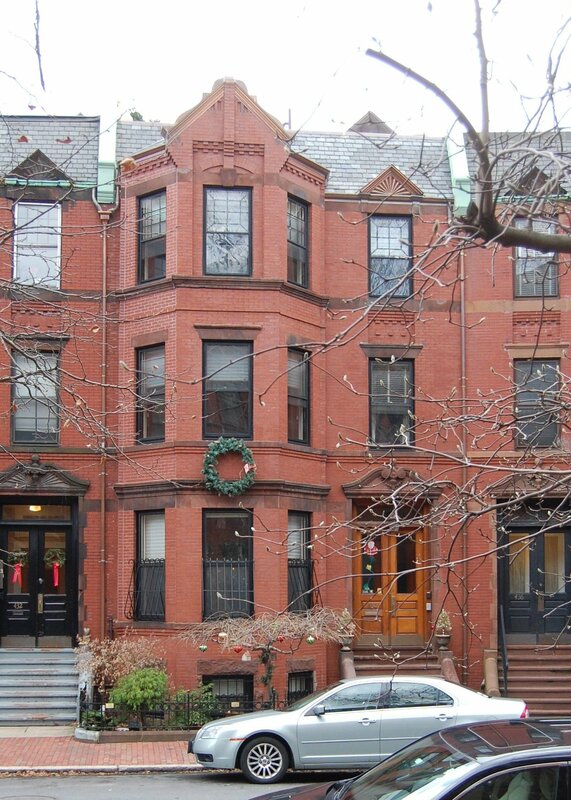 The Brownes continued to live at 434 Marlborough during the 1903-1904 winter season, but moved thereafter to Brookline. The Maynadiers also moved to Brookline at about that time. 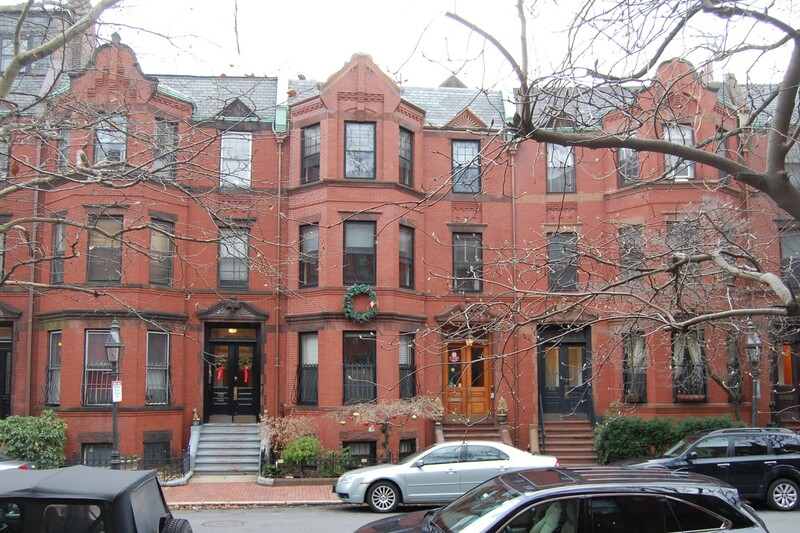 By the 1904-1905 winter season, 434 Marlborough was the home of Dr. Ernest Boyen Young, a physician and instructor at Harvard Medical School, and his wife, Grace Adams (Simonton) Young. He also maintained his medical office there. They previously had lived in an apartment at 499 Beacon, where he also had maintained his office. In 1905, the Youngs were joined at 434 Marlborough by Ernest Young’s brother, Arthur Jewett Young, an attorney, and by Dr. John Dresser Adams, a physician, who also maintained his office there. 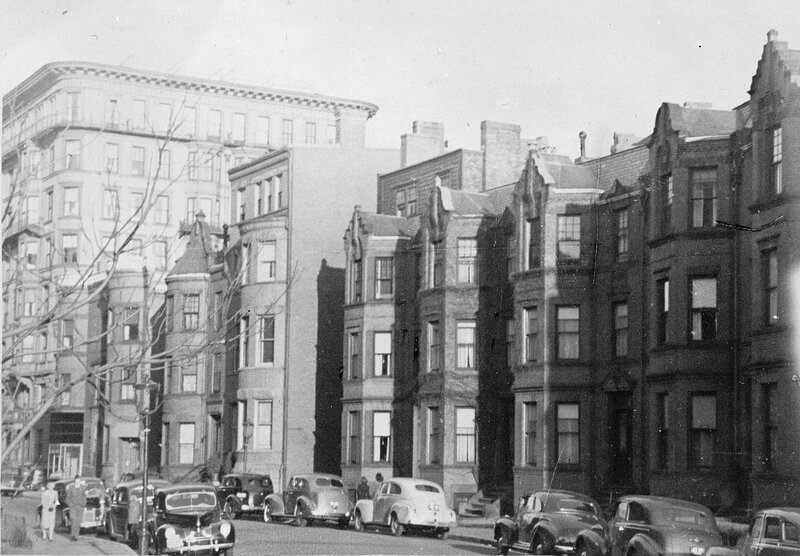 By 1906, Arthur Young had moved to 2 Brimmer and John Adams had moved to 925 Boylston. On July 28, 1906, John Herbert foreclosed on a mortgage given by Alexander Browne and sold 434 Marlborough to Herbert A. Buck. On August 7, 1906, it was acquired from Herbert Buck by George H. Stanton, and on August 9, 1906, it was acquired from him by Thomas Hunt. Ernest and Grace Young continued to live at 434 Marlborough, and on July 6, 1911, she acquired the house from Thomas Hunt. Ernest Young died in January of 1923. Grace Young and their only son, Charles Simonton Young, moved soon thereafter to an apartment at 416 Marlborough. On April 2, 1923, 434 Marborough was purchased from Grace Young by attorney Laurence Allyn Brown. He and his wife, Harriet Addams (Young) Brown, made it their home. They previously had lived at 127 Pinckney. They also maintained a home at Bass Rocks in Gloucester. Laurence Brown died in July of 1937. Harriet Brown continued to live at 434 Marlborough with their two children, Laurence Allyn Brown, Jr., and Dorothy Addams Brown. Harriet Brown died in 1952. Laurence Brown, Jr., an attorney, and Dorothy Brown, a bank executive, continued to live at 434 Marlborough. Laurence Brown, Jr., died in January of 1983. Dorothy Brown continued to lived at 434 Marlborough. On January 18, 1985, 434 Marlborough was purchased from Dorothy Brown by Barry D. Libert, trustee of the 434 Marlborough Street Realty Trust. On May 10, 1985, Barry Libert transferred the property to himself and his wife, Ellen Strauss (Marcus) Libert. Also in May of 1985, Milestone Associates (presumably on behalf of the Liberts) applied for (and subsequently received) permission to convert the house from a single-family dwelling into a two-family dwelling. They also received permission to add a roof deck, a steel deck off of the rear at the first floor level, an oriel window and door at the kitchen, and a new French door in the rear at the ground floor level. On August 8, 1988, 434 Marlborough was purchased from the Liberts by Harvard professor and chemical biologist Stuart Lee Schreiber and his wife, Mimi S. Packman. On July 14, 2003 (recorded July 21, 2003), 434 Marlborough was purchased from Stuart Schreiber and Mimi Packman by Ellen Sue (Baron) Driggin, the wife of attorney Seth Jon Driggin. On September 2, 2004, Ellen Driggin entered into a “Preservation Restriction Agreement” with the National Architectural Trust, Inc., for the purpose of ensuring preservation of 434 Marlborough’s exterior. 434 Marlborough subsequently changed hands. It remained a two-family dwelling in 2018.